Executive dysfunctions are common in individuals with Traumatic Brain Injury (TBI). However, change in functional neural coupling of default and executive networks in the post-acute phase (≥ 1 month after injury) patients over time has yet to be understood. During a 5-week observation period, we examined changes in the goal-oriented executive function networks in 20 TBI participants, using a face/scene matching 1-back fMRI task (Chen et al. 2011). We conducted multivariate pattern analysis to assess working memory and visual selective attention, followed by a repeat-measures ANOVA to examine longitudinal changes, with a cluster FDR at p = .001. Results showed that task accuracy significantly improved after follow-up. Significantly increased activity patterns over time were observed in the right dorsolateral prefrontal cortex and right insula. Decreased activity patterns were seen in the left posterior cingulate cortex (PCC), bilateral precuneus, right inferior occipital gyrus and right temporo-occipital junction. Improvement in task accuracy correlated with decreased activity patterns in the PCC (r = −0.478, p = 0.031) and temporo-occipital junction (r = −0.592, p = 0.006), which were interpreted as neural plastic changes. However, we did not observe the default mode network (DMN)-executive network decoupling during task performance that is found in other studies. 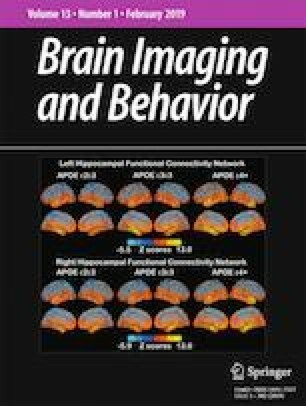 These results suggest that fMRI of attentional task performance could serve as a potential biomarker for neural plasticity of selective attention in TBI patients in the post-acute phase. Lei Wang and Fan-pei Gloria Yang Equal contribution co-senior author. The online version of this article ( https://doi.org/10.1007/s11682-019-00094-8) contains supplementary material, which is available to authorized users. The authors wish to thank the participating patients and a number of individuals who made this study possible, in particular: Anthony J.-W. Chen, MD for sharing the task design; Thorsten Kahnt, PhD for MVPA guidance; Amy Anne Herrold, PhD and James L Reilly, PhD for TBI consultation. This work was supported by a grant from the Taiwan Ministry of Science and Technology (NSC 103–2420-H-007-004-MY2) to Fan-pei Gloria Yang. There is no conflict of interests in our research. The task paradigm employed in this study has proved test–retest effects for TBI patients (Chen et al. 2011). In addition, in previous longitudinal studies with N-back tests, task-based fMRI showed robust test-retest effects (Koolschijn et al. 2011; Zanto et al. 2014) and no significant change (Fonville et al. 2015; Mattfeld et al. 2016; Sanchez-Carrion et al. 2008) in healthy adults.